We've all heard the saying, "A picture lasts a lifetime." But do they really? My grandmother's favorite hobby is genealogy. She has binders full of family trees and old photographs. I must admit, I find these binders fascinating! I love looking at the old photographs. Although they differ so much from our current photographic style, they are still full of emotion. And I can't help but wonder if my own photographs will last that long. There is a lot that goes into producing a photograph that will last a lifetime, such as the quality of the paper, the ink, and the elements (humidity, sunlight, etc). As you've heard me say before, professional labs are worth the extra cost - they are worth the investment. One of our latest products is an Art Print. These prints are printed on fine or linen paper. The awesome quality of Art Prints is their longevity. They are made to last. They will last 200 plus years with less than 8% color fade during this time. Ah-mazing! And now you can try one for FREE! 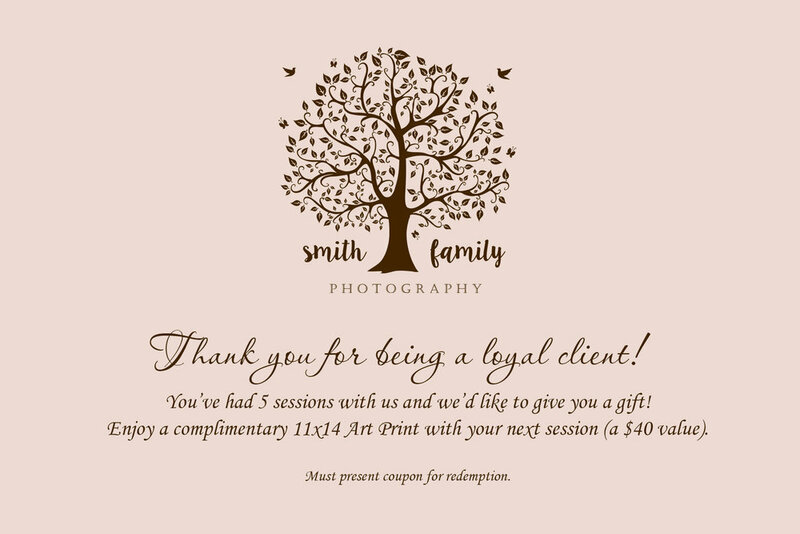 After you have booked five sessions, you will receive a coupon good for one complimentary 11x14 Art Print from your next session. I can't wait for you to experience them for yourself! They truly are an investment for your family's memories.